Pass it to Bulis: What Are Your Top Five Moments of Wizardous Sedinerie? What Are Your Top Five Moments of Wizardous Sedinerie? In just under two weeks, PITB will be counting down our top 5 moments of Wizardous Sedinerie from the 2010-11 season, just as we did last year. Solemn guarantee: it's gonna be a sweet list. While there isn't a de facto number one this year, that doesn't mean the Sedins have been scoring boring. They've done some mind-blowing stuff this year. I've managed to pare their ever-expanding highlight reel down to 12 wizardous plays, all of which are embedded after the jump. I'm angling for a top five, and I could use some reader input. If you've got the time (and I know you do, slacker), watch the clips. When you feel you've given each play a fair viewing, give me your five favourites, either in the comments, via tweet, using the hashtag #sedintop5. In two weeks, we'll unveil the official list. Be warned, however: five minutes watching their highlights and you'll lose the ability to find joy in the simple play. The next time someone dumps the puck in instead of cutting across the blue line and making a drop pass to his identical twin, you'll scream at the television. You'll see an open guy, and wonder why his teammate didn't make the simple no-look, backhand saucer bank pass off the boards his defender was giving him. You'll see your guy getting crosschecked in the back and you'll wonder why he isn't calling for the puck. The Sedins are hockey ecstasy. The Sedins will ruin you. Edit: the official list has been unveiled. Go HERE to check out which plays fell where. in no particular order: 4, 5, 6, 9, 10. Also - we are not only all canucks, but we are all spoiled. Right now a rhyme I cannot enter. Although of course I did you see! the words do lack a truthful ring. The rhyme's to go you will agree. and Alex Burrows in between! #1 makes my head spin. Like how did they do that? That's some straight up Super NES NHL 93 stuff going on. #3 just cos it's a great goal. #7 just cos it's Thornton's fault. #9 just cos it's definitely a thing of beauty. #10 is pure Ovechkin...which is weird cos he looks an awful like Henrik. How the f**k do these goals even happen wtf they're INSANE. Poor Crow in Vid 5. You know he's thinking "Damn, I used to be their coach, not look at these sad sacks of players I'm stuck with." Vid 5 blows my mind. Can you imagine the frustration of setting up a perfect 4-man box and having Henrik Sedin destroy it with one insane saucer pass? He flips it over all of them, right onto Daniel's stick. BTW, number 9, without a doubt. So much passing you think it's too much, but they make it work. This should be fun. Ima get right liquored up then watch the clips and give you my picks. Oh, who am I kidding, I'm gonna get drunk then pass out and barely get up tomorrow in time for the Whitecaps game. Talk to you on Monday. Oh, by the way, this is an awesome blog. The mix of intelligent insight and great humour has gotten this blog a premium spot on my bookmarks bar. Can I ask how you guys selected these? Did you keep a list as the season progressed or something? 7: That rule again of one more pass than is necessary! 9: MY OTHER FAVOURITE GOAL FROM THIS SEASON. I love that one of the Stars sighs on the way to the bench. It just sums it up. The set up from Yann Sauve onwards is just magical. HARLEM GLOBETROTTERS OF HOCKEY. 10: 'Oh man what a nice move' - SUMS IT UP. Who else could do something that Forsbergian than our Captain? 1, 2, 7, 10 & 12. I'm partial to the goals that don't feel like clinics (i.e., Oilers games, when there's clearly no defense, thus no contest). I love to see how they think on their toes, under pressure. How we selected these? Well, we've attached the "Wizardous Sedinerie" label to every IWTG that has an amazing Sedin goal in it. You can basically just click the link and run back through those games and goals in a hurry. So I did that. 4 - Has everything 9 does, plus a brilliant ricochet pass to start off. 9 - Beautiful passing, but made easier considering they had a 3 on 1. 8 - Daniel's deke in close makes this play worthy of 3rd place. 3 - They just made Columbus look silly, although who doesn't? 12 - Great play, though it's mostly an individual effort by Daniel. Pure Sedinerie should involve both Henrik and Daniel, in my opinion. #4, the bank-off-the-boards play is beautiful, the tape-to-tape passing is so crisp, and they pull Dubnyk so far out of position you'd think he was heading to the bench for an extra attacker. The WTFjusthappened look on Crow's face is priceless. #11, like a bunch of b-ballers playing keep-away with a jockey. No-look off-the-boards back pass to saucer back pass to front of the net to back of the net. Epic. #2, even in slow-mo this one goes by fast. Watch Hank rush the net before Daniel even gets the puck... Daniel's perfect no-look back pass... Hank roofs it with about a foot of space open over Ellis' shoulder, while in tight. Everyone's high-fiving and already on their way back to the bench while Ellis is still dazed and hugging the post, then looking around like "What? It went in?" I'm going to say 3, 4, 9, 5, 10. 3 for the look of disbelief on the face of the other coach alone. well, if I wasn't ruined by watching the twins before, I certainly am now. I love #4, simply for the look on the coach's face after the goal. Shock, awe and frustration all in one... I wonder how long it took for him to pick his jaw up off the ground. Forget a top 5, make it a top 10 and you'll have an easier time deciding. 7, 9, 10 are all too legendary to ignore, have to make the cut. Meanwhile, 5 and 12 involve gorgeous first assists by Oreskovich and Edler which somewhat disqualifies them in my mind (somehow Burrows' passing is still Wizardous Sedinerie). It's pretty hard for me to choose just 5 of them. They were all insane. But for me, I guess it would be #9, #10, the first one I mentioned above, #6, and #8. 3 4 8 9 !!!10!!! No one has players like this. Unbelievable. My top 5, and it was difficult and could change if I watched them all again, are: 4,7,8,9,10. The most frustrating thing about going through these vids is, once you think you're narrowing it down, you notice something you didn't see before. I JUST realized Daniel gets the first touch on #7. He tips it to Henrik, who passes it back, and it happens in about half a second. 3, 4, 7, 9, 10 - but all are things of beauty! It's a bit early to make this list. Wasn't the play of the Year in the final game last year? I would tell you which ones I like best, but I have forgotten how. I have been ruined. First of all thanks again PiTB(PRESIDENT'S in THE BAG) for this and everything else. Watching these left me joyously agog. 3,5,7,9,10 with 9 being the best. would have liked to see the powerplay goal against the blackhawks that henrik scored this year.. the pass from samuelsson from the point... but GREAT LIST! 5, 7, 9, 10, and 6 I guess. 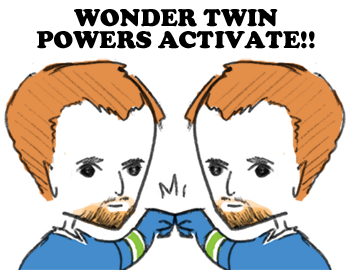 Though for 6 I'd credit it more to Burrows wizardry than the Wonder Twins. Also, put up the one where Daniel banks the shot off Lidstrom and into the net! Wher's hank’s clutch goal against the hawks? 4,6,9,10,12.....and it took me awhile to narrow it to that. To me Wizardous Sedinerie means more passes than anyone else would ever make, including at least one Sedin touching it twice. So with that in mind, my choices are 4, 5, 7, 8, 9 and 10 (because it is just awesome). I can't help but notice how many of these goals are against the Oilers. Looking forward to tonight's game! We may have more to consider before this season is over. Just spent like an hour watching these vids.... still can't decide. Ooops, lost count. They're all good! Take #8 off my list. So 4, 5, 7, 9 and 10 are my Top 5. In no particular order 9-9-9-9-9, watched that goal a hundred times and it never gets old. Come on! They're all GREAT! Maybe you can add this to your list. After tonight, you HAVE to add Kesler's tying goal to this. Daniel looking in to break alone, instead slows up for the spin around backhand no look pass to Henrik, who of course was expecting it and does a quick one touch to Kesler who fires it in. Gorgeous. Was This Goal a Set Play? Factual Inaccuracies in "How The West Was One"
Can You Name the Entire 2010-11 Canucks Roster?